We at Hi-Point® Firearms believe that a good firearm owner is a responsible well-practiced firearm owner. We believe in helping shooters improve their skills, and shooting drills are fun for all. We have added this new training aids page, offering free to download target drills. 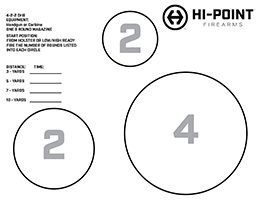 These drills are built with the magazine capacity of all Hi-Point® Firearms in mind. These drills can be printed on 8 1/2x11 paper and can be utilized on virtually any range. *Always consult with a Range Officer before performing any drlls on the range.